The module website opened two days ago, and wow, what a difference between expectations and reality. The module website for TU100 is likewise high quality. Though some things are a bit difficult to find (normally because something has been renamed since directions to it were created), it’s over-all a great way to organise the huge amounts of data I’m going to have to assimilate this year. The best news is that I don’t have to wait for any of my materials to arrive before my soft start. All texts are available online, as well as nearly every other resource. There are only two things that are not entirely available online: the SenseBoard itself, and some full-length TV episodes from an OU/BBC collaboration. The Sense software, however, has a virtual SenseBoard so that the actual one isn’t strictly necessary, and there are clips of the TV episodes relevant to our studies online. I could do the entire module with what’s available now. The module site is broken down into three columns: Assessment and Support information, the planner, and resources. The most important of these is the planner. It defaults to showing 5 weeks ahead, but can also show the entire module, broken down into a week-by-week guideline of what to study when. In addition to being a to-do list, it also has tick-boxes to track your progress, and links directly to the relevant resource for each step. The assessment and support information column has the names, due dates, and results for the various types of assessment: TMA (Tutor Marked Assignment) and iCMA (Interactive Computer Marked Assignment) are the only two for TU100, but TMA6 is also an EMA (End of Module Assignment). Contact information for your Tutor (and tutorials information) or Student Services is also displayed. The final resources column is almost as invaluable as the planner. It has any news relevant to the module, discussion forums, and then links to pages where resources have been grouped by type or use. So what’s a resource? It could be an online or eReader book, a diagram, a questionairre, a hand-out, software download, or basically anything else you need to get your module done. Obviously as one of the things we’ll be studying is the Internet and accessing things there, you’ll have to visit other sites for that, but otherwise, it’s a great self-contained collection of information. It almost wouldn’t require you to leave the site to complete the module if it wasn’t specifically teaching you about other parts of the Internet. Also, I found out that my materials were shipped out yesterday, so even though I don’t technically need them, they should be here shortly. Technically, the first module for my degree course will start 1 October. But that’s a Saturday. Who starts anything on a Saturday? Heck, even weekends start Friday night. So there are realistically two other dates which combine for a ‘soft start’ to the module, ahead of the 1 October hard start. These dates are the Module Website Live/Open date, and the date materials are received. One might think that this would be one or two days after the Materials Despatch date, but often materials seem to be received the day before this date, so who knows. The website open date for TU100 this year is 6 September, and the Materials Despatch date is 9 September. Since that’s a Friday, I expect that the materials will probably show up the following Tuesday. So I’m going to call the Soft Start date for TU100 this year 13 September. We’ll call that three weeks away. So what’s happened lately, and what’s going to happen? Yesterday, our Introduction Forums opened. They’re rather hard to find, though. The site they’re on is called “Student Support Forums” allegedly under the Student Planner. But I can’t actually find a link to the Student Planner anywhere. That’s one of the major flaws of the OU: They keep coming up with great new ideas, but they don’t remove all the old ideas, so it’s kind of like trying to find your way through a really old London hotel that’s been cobbled together from a few other buildings. You can’t necessarily get to the next room by walking in a straight line. It may require you to go back up the hall, take a lift down, over a hallway, take a half flight of stairs to a mezzanine, and then swing across a chasm to the room. Anyway, don’t lose your link, or you’ll never find your way back to the Student Support Forums. I think it’s because they’ve opened them before opening our website. The Introduction Forums have been positively flooded. There’s several dozen posts already for Computing & IT, and only the Psychology forum comes close to the same number. And the Psychology intro forum looks like someone’s kicked over an ant hill. There’s hundreds of conversations all over the place, so I don’t know if it’s lots of different people talking, or the same three creating a new thread every time they have a new thought. I suspect the former, however, as I’ve read that Psychology had the largest intake of new students every year. This kicked off a new spate of new Facebook groups. I think that’s really a good thing, though. Because if each of these groups has a slightly different flavour, it’s going to be easier to find one that works for me and my specific needs. It also brought up a topic which had been brought up a few times in the past couple of weeks: Sense. Once again, Sense is the customised version of Scratch developed specifically for TU100. Our Introduction Forum moderator sort of warned everybody that they’d damage their brains if they downloaded Scratch, and that they’d be risking eternal damnation if they downloaded Sense from the OU before the Official Grand High Link from the Module Website opened. Which is rubbish. Download Sense and play with it. It’s not as good as modern Scratch, but it’s fun. If you want a more useful language that’s still exactly as simple, download Scratch or use the cloud version. Heck, download Scratch 1.4, which is nearly identical to Sense except for TU100 specific things. If you want to know what to do with Sense, search for tutorials on Scratch 1.4. Or, y’know, wait for the soft start. Edit 14/03/2017: I’ve added the block contents of the two modules in another post, so you can finally compare which concepts you do or don’t have. The question of which maths module to take is one that comes up a fair bit for students of the Open University, especially in STEM degrees. It comes up so often, in fact, that the OU has a site devoted to the question. For most people, this will mean choosing between MU123 (Discovering Mathematics) and the more difficult MST124 (Essential Mathematics I). For some degrees, such as Maths, Physics, or Engineering degrees, the question is merely one of where you should start, as you’ll likely need to take and pass MST124 anyway at some point along your path. But for other degrees, you’re simply required to take a maths class, and which of the two you choose is completely up to you, with no effect on your degree or its classification. As they’re Stage 1 modules, your pass level won’t affect classification. However, MU123 has a basic pass/fail structure, while MST124 allows the awarding of a distinction. I wouldn’t think this at all important, but someone pointed out that if they apply for a job while still on the degree course, it might be nice to say they passed all Stage 1 modules with a distinction. I’ve mentioned earlier that I’m A) an immigrant, and B) a drop-out, so that makes deciding which maths to go into more difficult. I was in advanced maths when I dropped out of high school early. This would have meant I finished with the same amount of maths as non-advanced maths, but still beyond the compulsory amount required for all students. But I also skipped a year of maths before that, and had to self-teach some. So I’m left trying to match that up with “GCSE Maths” and “A-Level Maths” without anybody realising that the curriculum changes from time to time. It would be so much easier if they simply said which mathematical concepts you needed to be familiar and comfortable with. When I took the practice quizzes at the above mentioned site, I breezed through the MU123 quiz. When I took the MST124 quiz, I did alright through the first half of the questions, but it was taking me forever to remember formulas and rules I haven’t used in twenty years. And the questions just felt tedious. And I figured I just didn’t need that in my life. So I didn’t even complete it. Since it doesn’t make a difference to my degree, and it will be easier for me to get through and not burn me out, I was all set to simply take MU123 next year and never look back. Working in the industry for as long as I have, I’m fairly certain it won’t ever come up in my job. That was, however, before I encountered the Hitbox. On a great series of MOOCs that I’m doing, I’m currently coding some graphics programmes. In all of the practice programmes we’re assigned so far, it asks us to only concern ourselves with the center point of the image, and pretend that if the image wanders halfway off the side of the screen, that’s still within the boundary of the screen. But what if it’s approaching the boundary at an angle? Now the corner of my image is further in the X or Y coordinate than half the image height or width. How do I figure that out? It’s clear to see that the closest I can get to the top edge on the Y axis is going to be the distance between the center of my image and the corner of the image (also calculated using simple trigonometry) multiplied by the cosine of the indicated angle. Cosine(y) = Adjacent Y/Hypotenuse Y, so Hypotenuse Y * Cosine(y) = Adjacent Y. 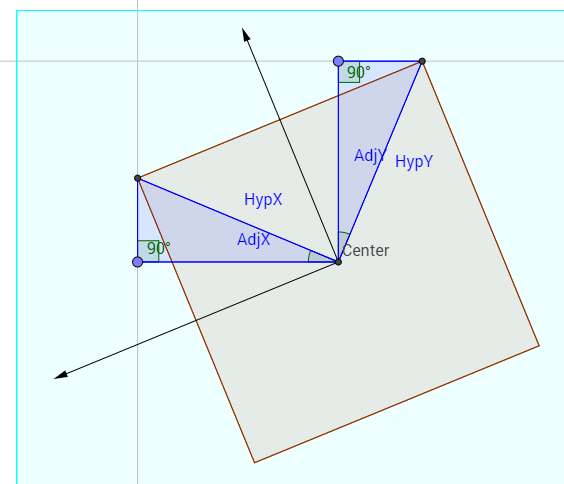 Similarly, I need that same hypotenuse (all corners will be the same distance away from the center in a square or rectangular image) multiplied by Cosine(x) to determine how close I can get along the X axis. It’s still not that difficult to calculate hitboxes, as it becomes a series of intercepting slopes being greater than or less than line segment points. But the hitbox is just one tiny thing to calculate. And already my shortcomings in maths could have hampered a solution if I hadn’t prepared myself. So I think I’m now edging toward MST124. 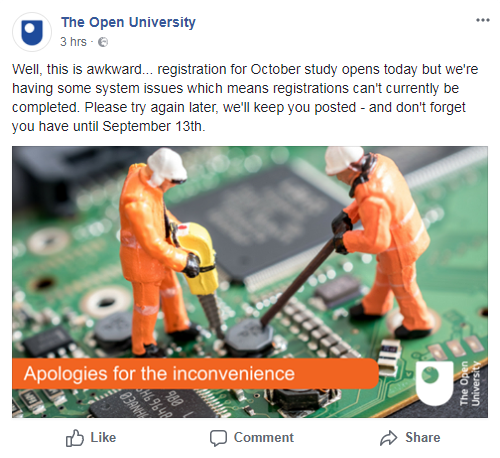 To be clear, I don’t plan to go into programming, and though I’d love a proper Computer Science degree, this is as close as the Open University gets. But I would like to have as many bases covered as possible, and not regret that I should have had more maths under my belt when I come across something I hadn’t considered in the future. Besides, I did go back and finish the MST124 Are You Ready quiz, and it agrees that it’s a decent fit.